ADINA is extensively used in cardiovascular mechanics research. In addition to its accuracy and reliability, another reason for this widespread adoption is the integrated offering of advanced solution capabilities for modeling structures, fluids and FSI problems. This enables researchers to study the highly nonlinear response of tissues/organs (which may include geometric, material and contact nonlinearities) interacting with general Navier-Stokes fluids. In this News, we highlight a study that investigates the effect of microcalcification on the vulnerable plaque mechanics in the arteries. This study is motivated by the fact that vulnerable plaque rupture is one of the leading causes for sudden heart attacks (see Ref.). 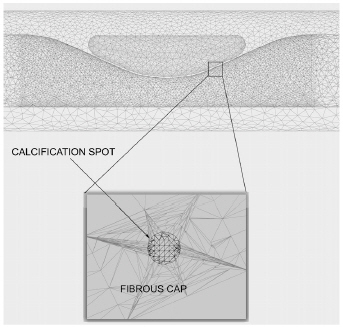 Figure 1 shows the representative model of the vessel wall, vulnerable plaque (lipid) and inclusion (calcification). The aim of the study is to investigate the effect of calcification on the stresses induced in the artery under physiological flow dynamic conditions using a 3D FSI model. A portion of the computational grid around the plaque is depicted in Figure 2. The solid and fluid phases are modeled with about 900,000 elements and the transient dynamic analysis is performed for a total of 2,500 time steps, representing two flow cycles. 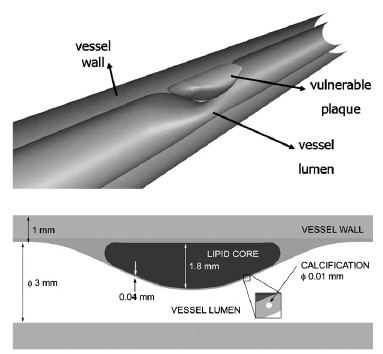 The vessel wall, lipid core and fibrous cap are modeled using an isotropic incompressible hyperelastic material model (the Mooney-Rivlin model). The blood is modeled as a Newtonian incompressible Navier-Stokes fluid. The problem is solved using direct FSI coupling since the response of the structure and fluid are strongly coupled. The large deformations and large strains of the blood artery are taken into account. The ALE approach is used to accommodate the large deformations of the artery. The first animation above shows a side view and a top view of the velocity field along longitudinal sections of the vessel. The second animation depicts the pressure field in the blood and also the deformations of the vessel wall during the flow, all in the vicinity of the lipid core. 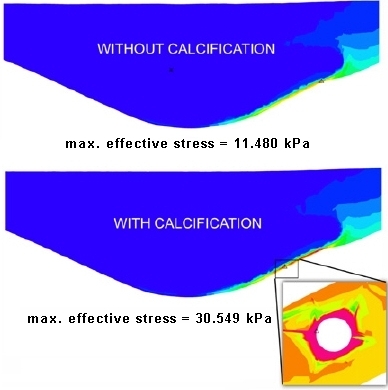 While the presence of microcalcification does not have a noticeable effect on the flow, it significantly increases the peak stress level in the solid phase (Figure 3). This high stress concentration can be the cause for the plaque rupture. The animation below depicts the evolution of the stress field around the inclusion during the flow cycle.